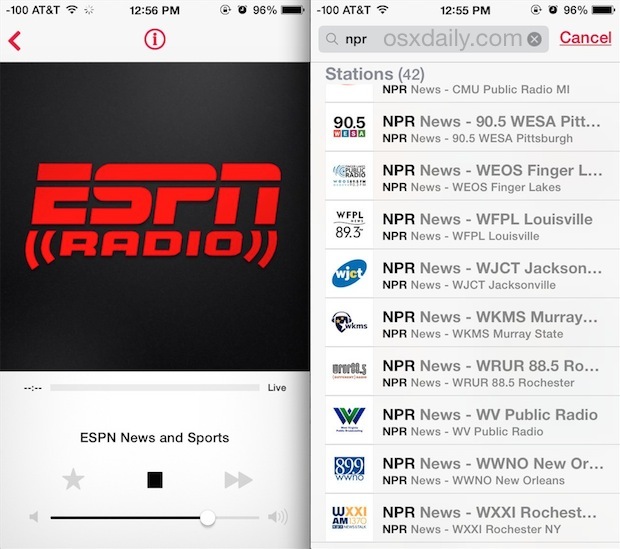 Fans of talk radio, sports radio, and classical music will be pleased to discover that iTunes Radio now offers streams of ESPN Radio along with an abundance of local NPR stations. The ESPN Radio stream includes popular talk radio sports shows including SportsCenter, Mike & Mike, The Herd, The Dan LeBatard Show, The Freddie Colman Show, and others. Additionally, ESPN radio will broadcast special events through the station, including FIFA World Cup, NBA, MLB playoffs and World Series, and NCAA college football (!). A national network NPR station has been on iTunes Radio for a few months, but the addition of local affiliate NPR stations is new. In a quick search we counted over 42 local NPR affiliate stations available, including KQED San Francisco, KPCC Los Angeles, KUT Austin, WBEZ Chicago, WNYC New York, WAMU DC, OPB Oregon, KUNC Colorado, MTPR Montana, KUOW Seattle, amongst many others. New NPR stations are expected to be added as well. 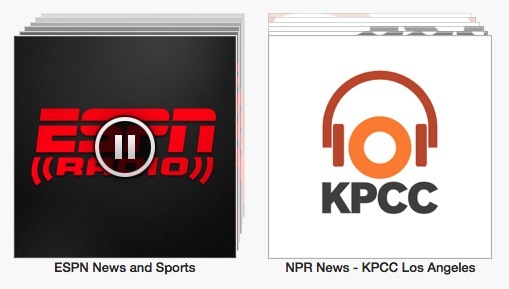 To listen to either ESPN Radio or a local NPR station through iTunes Radio, you simply need to add the channel. This can be done in the iTunes app on a desktop Mac or PC, or the Music app in iOS. Stations added to iTunes Radio on the desktop will sync to the Music app on your iOS devices, assuming they use the same Apple ID. That goes the other direction too. You can add as many NPR affiliate stations as you want, so if you decide you’re tired of whatevers on WWNO New Orleans you can add or jump to KPCC Los Angeles by repeating the above process. Once added, you can also play the Radio stations through Siri commands or send it along to a friend. 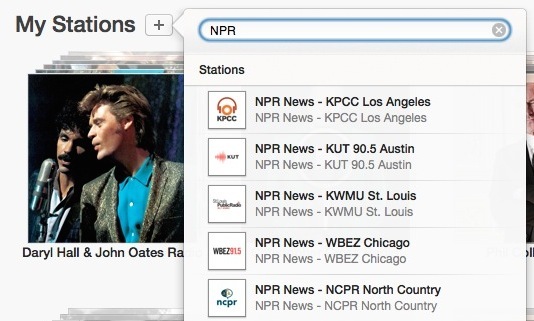 Again, stations added on an iPhone or iPad will sync back over to iTunes Radio on the desktop app as well. Currently, iTunes Radio has limited global coverage primarily focused on the US market. Nonetheless, users outside of the USA can listen to iTunes Radio by creating a new Apple ID that uses a US-based address. That may be particularly helpful for international users looking to listen to World Cup games live. Keep in mind that listening to streaming audio on a cellular 3G, 4G, or LTE connection can be bandwidth hungry, so those without unlimited data plans may wish to join wi-fi networks before streaming the new iTunes Radio stations. Good hint! Thanks. But my local station WGCU isn’t on the list, darn it; and each time you go to find a new station, you have to hit ‘Show More’ over and over and over. The app for my local station WGCU allows me to add any other public radio station. The app also allows you to pause live while you are on the phone or doing something else. I like to have a station in each time zone so that I can hear shows if I miss them. Plus there is some great local programming. This tip also gives you access to playing ESPN/NPR over your home entertainment system via AppleTV.